Some of you know about what happened with my older son, but most of you do not. None of this was David related until he announced the mission. It was then that a cycle of pain and loss restarted in my heart, and now, after many weeks of processing it all, I felt compelled to share it, with the hope that it may help someone. My oldest child, now age 12, was diagnosed with Autism at the age of two-and-a-half. He was a healthy baby and was developing normally until 16 months, when he received 4 vaccinations during a routine office visit. Within one week of that day he lost all his words, eye contact, and started to have severe bowel issues. I am not trying to start a debate about vaccines, I am just telling you what happened to my child. Thus began our journey into the pit of despair and heartache. Several doctors, tests, and hours of research later we began to understand what we could do to begin to try to heal his physical and sensory problems. The first step was special education preschool. The district here that diagnosed him told us that he would never speak, dress himself, never be able to live alone or have a relationship. We were told to start looking into long-term care options. Words cannot describe the loss and devastation that we felt. I’ll never forget the first day of preschool. I had to take him there; I just couldn’t let him take the school bus; he just looked so tiny. I dropped him off, both of us sobbing. The teacher had to block the door to keep him from getting out. I went out to my car and cried and cried and cried. I didn’t want to take him there. He was supposed to be home with me. Did he know I was coming back for him? Did he understand what I told him about school and that it would help him? Would it even help him? I trusted no one. Who were they to tell me what my child’s future would be? I sat there in the parking lot in my car sobbing. When I finally went in to get him I was so relieved. He seemed fine. The thought of doing it again the next day was too much to think about. His preschool day was two-and-a-half hours every morning. The longest two-and-a-half hours you could ever imagine. In the meantime we were working on special diets, vitamins, sensory therapy and lab tests to help with the bowel issues. I thanked God for credit cards and that we were able to get high credit limits. Everything we tried with him was very successful and immediate. We did everything outside of mainstream medicine with the help of a doctor who I know is an angel. We went through about 15 doctors before we found her. The preschool was awesome, and it truly was needed to help him catch up on things he had missed. But having him gone everyday, even though it was just the half day, was very depressing. It was a true loss. Then after preschool would come elementary school. I would never get those preschool years back. I never did get those years back. But what I did get was something even greater. Our son began to speak again. He began to interact with us. He was able to handle sensory input. He has been in a regular classroom setting since Kindergarten. He continued with speech therapy through 3rd grade. He was able to stop the special diet after 5 years. He is now in 7th grade and has all A’s in school. He scored within his grade level on the MEAP test two years in a row now. He has friends, sleepovers, normal relationships and is an awesome big brother. Over time I began to accept that this journey with my son was somehow meant to be. I ended up working at the sensory clinic that helped him so much. I was able to talk to and give hope to thousands of parents. I was able to work with the children and see them progress. I have been witness to the restoration of my son’s health and well-being. I have come from the depths of despair to the triumph of redemption. When David announced his mission I was in shock. The next morning I cried for six hours. I had not cried like that since that morning at preschool. All the feelings of loss and fairness and right and wrong and why and how came rushing back. I was losing my baby again. I know he’s not a baby, and he’s not mine, but you all know and understand that is exactly what it feels like. Much like taking my son to that preschool, this was something that had to be done despite how I felt about it. It was going to happen, and all my tears and frustration were no match for it. I came to accept that just as I took my son and handed him over to strangers, I had to support David in his choice because what is best for me is not necessarily the best for him. I could have not sent my son to preschool and kept him home with me. But I had to do what was best for him, despite my own pain. For those of you that have not experienced a loss, and even for those who have, David’s leaving is devastating. The routine and activities of the last 4 years will change. We will have to find a new normal. And we will. Nothing will stop what is meant to be for David. We must be strong and have faith that the future will bring nothing but the best of times for all of us. My journey with my son taught me that even though things seem impossible you can never give up hope. We cannot get back the two years that he will be away. What we can do is be here to support one another, buy whatever music comes out, and take good care of the love we have in our hearts for him. One by one we were chosen to be on this journey, for reasons we may never know. 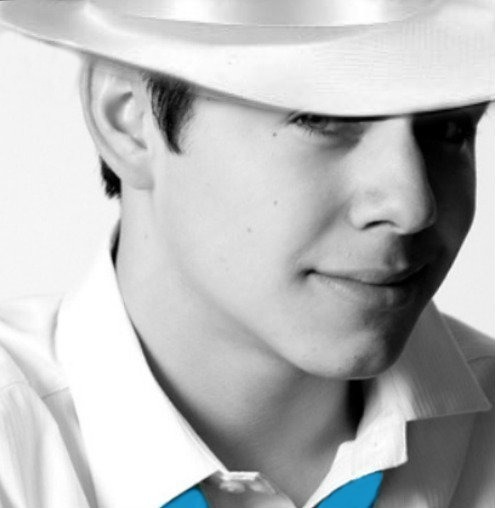 His voice took root in our hearts. His spirit made our own start to blossom. Now we must tend to the garden while he is away. 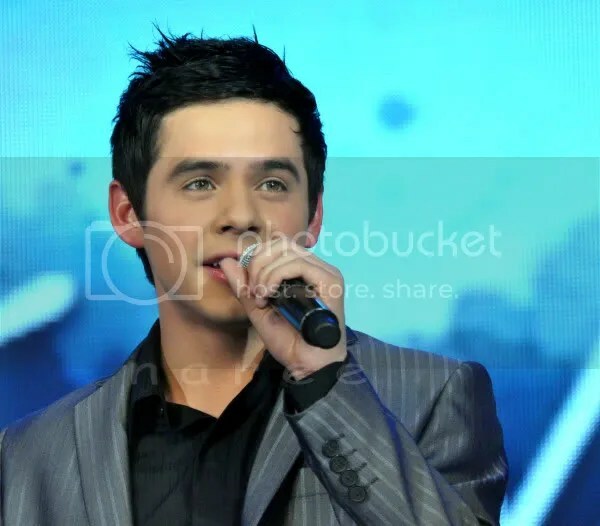 This entry was posted on Tuesday, June 26, 2012 at 12:42 AM	and is filed under David Archuleta, Respect, The Voice. 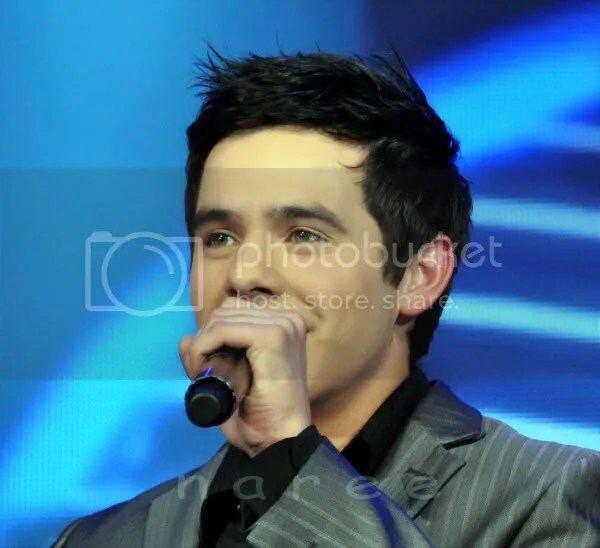 Tagged: David Archuleta, David Archuleta rocks! :), from the heart, Gotta love him, hope, missing him, Standing by him, the Voice. You can follow any responses to this entry through the RSS 2.0 feed. You can leave a response, or trackback from your own site. I am so moved by your story that ended me in tears. However, I shall thank you for sharing this with all of the readers fan or non-fans it might help some suffering families.Just like me I am an orphan since I was four yrs old. My father died and then followed by my mom. I started working in the farm at 7 and it was a hard life. My childhood years was taken away from me. I literally escaped childhood fast. But Jesus Christ has healed me of pain and sufferings. He carried me thru my journey until now. We must keep our faith, make it even stronger. We must be brave and we must love God more than anything in this world. We may not all understand but He has all the reason to all these. Will pray for each other. God loves you so dearly. Funnygirl, I am moved by your story and at the same time brought back sadness and pain in my heart. I am crying as I write this. I have 2 nephews and 2 nieces with autism, so I can relate to what you had gone thru. It is already challenging enough to raise kids nowadays, so how much more if it is a “special” kid. One nephew and one niece of mine aren’t doing very well; however, the other two are just doing fine although they seem to have problem having normal relationships. You are very lucky for your son is doing really well and having a normal childhood. God is good! Bless your heart for helping and giving other parents hope. And talking about loss…… When I found out that David was going on a two-year mission, I cried. I don’t know why and I can’t explain, but I felt like I’ve lost a son. For a moment, I was grieving. Yes, I am a new fan of David, but I do feel like I’ve known him all my life. I love him as if he is my own son. It may seem odd for I have not even met David nor watched any of his shows. 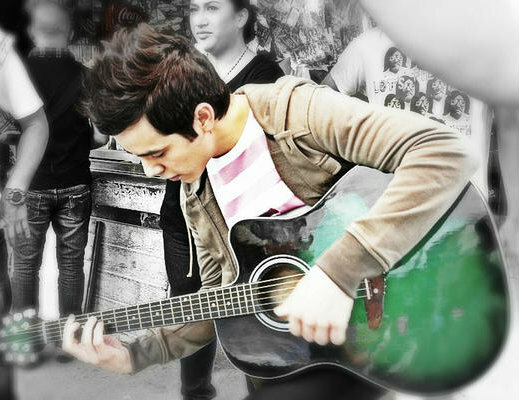 I only knew him thru posted videos, interviews, news, magazine or internet articles and fan blogs. Getting to know a little bit about him makes me feel good inside. For those who are lucky to have met him, I can only imagine how much sadness and pain his mission announcement might have brought upon them. But God has a plan for each and everyone of us, including David. 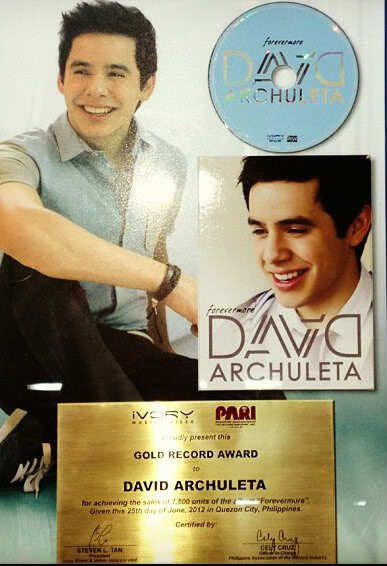 God has given David to us so that he can be an inspiration. There is a common denominator in all these……….LOVE…….and it is now up to us to chose what we do with it. Thank you for such an honest story about your son’s ability to overcome his struggles with Autism. Our children are sent as messengers to show us how to achieve success in areas we need help the most. You learned the lesson of determination. Things don’t always happen in the fastest way, but the end result is worth the journey. I am fortunate that I haven’t had to go through what you have, but I have a freind with an autistic daughter. She wasn’t as fortunate to have found the right school from the beginning. But luckily she finally did when her daughter was almost 14. (She is 18 now.) She is making wonderful progress but still has a long way to go. I’m so glad to hear that your son has made such amazing progress. Your story is a lesson in hope and perseverence. We are stronger than we know. Bless you and your family. ♥ Thank you for sharing your story with us. Maybe it’s David’s hope, and faith, and heart full of love that binds us to him. HIs belief that anything is possible. Thank you for your incredibly moving story. Your journey of loss and redemption strikes a chord in all of us, regardless of our separate tribulations that cause pain and suffering. Yours is a story of amazing courage. It is also a story of hope; not a wishful hoping, but real hope, a spiritual hope, which somehow springs forth to sustain us during our darkest moments. The impact of David’s absence has offered a variety of surprises for me, everything from an awful sense of loss to absolute joy that he is serving a mission. Thank you again for sharing your experience and for your strengthening perspective. Tend to the garden we will. mission. I felt numb and was in shock for a few days and couldn’t quit crying. I couldn’t believe that someone I have never met could effect me that way. I’m very happy for him now because he is doing something he wanted to do for awhile. He is one of the most beautiful and spiritual human beings and deserves to be right where he is!! (((((FG)))) thank you so much for sharing your story, that can’t have been easy for you. So happy to hear your son is now doing so well, such a wonderful example of how powerful love and faith can be. FG – I salute you and your family for your resilience and strength. Thank you for sharing. HUGS! ‘We will have to find a new normal. And we will. Nothing will stop what is meant to be for David. We must be strong and have faith that the future will bring nothing but the best of times for all of us. My journey with my son taught me that even though things seem impossible you can never give up hope. It was late last night when I decided at the last minute, since this is your story, to incorporate into the lead image a pic that I know has special meaning for you. 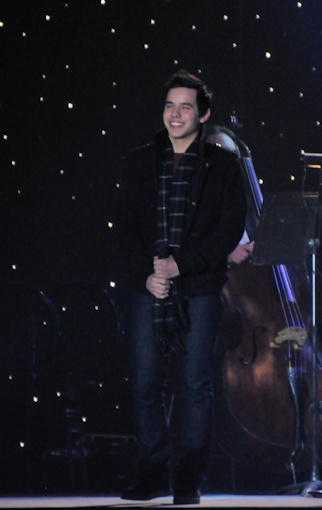 The pic you saw of David at rehearsal with the MOTAB and knew right then and there, you had to be there. I’m so glad you made it and I was able to share that out of body experience with you. Gonna include the link to that article of yours here because I love it and the memories and because it relates to this one. 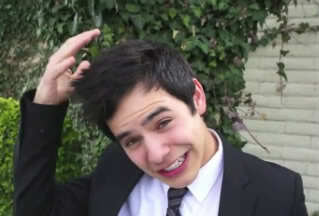 How is it possible to love someone who isn’t family as much as we love David? I don’t know but it is a real love and like you say, we need to “take good care of the love we have in our hearts for him.” It is a gift. I have lost two brothers, one older brother, his name was Cesar and a sister younger than meHer name was Edith. I want to think that God had another plan for them. I was too young when I lost, I knew very little, but I still miss them. Thanks for sharing your story, I’m grateful, I’m not alone. 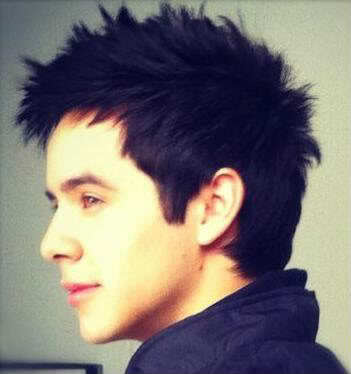 I think it was my heart who realized the existence of david. When I saw him for the first time I saw a beautiful boy, but when I hear your voice, my heart took the desicion to elect David. And gradually he began to take my soul, too. I do not know David, and sometimes I think if I ever meet him. Every night before going to sleep, I pray for my family and everyone in general, but David has a special place. Each night I ask my brothers, Edith and Cesar-please take care of David. Each one of us know how David changed our lives. 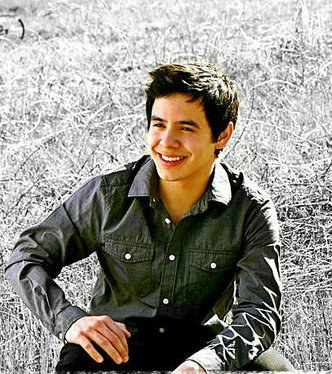 I wonder how it will be my future, it is impossible, I have only one desire, to have David with me for the rest of my life. 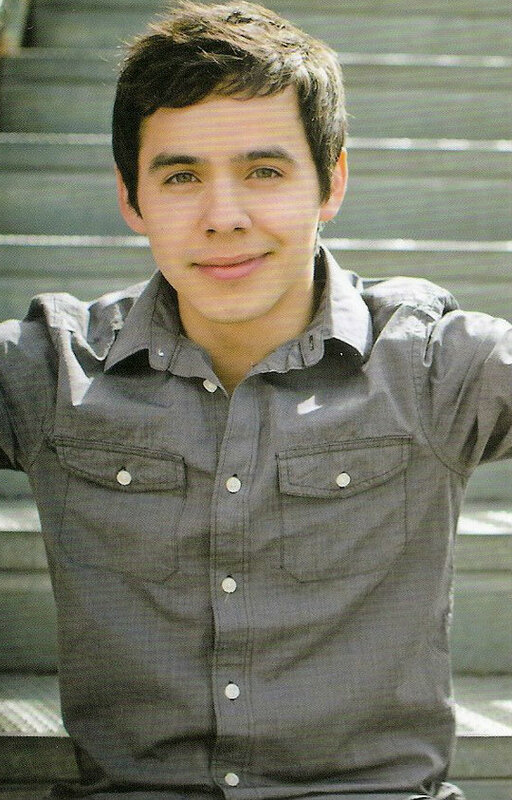 I love you David and I will always love you. FG I remember feeling the same kind of “long ago, but familiar pain” at that moment too.I had felt it before. 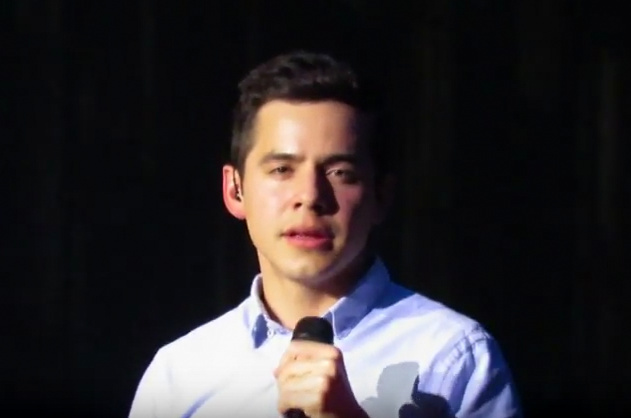 You are right Angelica, it is real, the love we have in our hearts for David.It is different, and it is wonderful, and it is a gift to be treasured and cared for.♥I don’t think we ended up in this “Good Place” by mistake. FG Thank you for sharing your story and experience. As many have stated I and my family have experienced some devastating losses. Many of us find ways through faith, support and each other to cope. Probably the biggest help is giving back and or honoring the ones lost in a meaningful way : ie; Scholarships, charitable causes etc. By supporting one another we gain strength. I’ve been pleasantly surprised at all the gifts we have received from David and his fans to aid us during his absence. I promised David in a letter between SLC and BC that I would re-evaluate my own life and faith and also told him how much he had inspired me. I’m in that process and have joined the Optimist Club to help the Youth of our community etc. You now have inspired me even more. 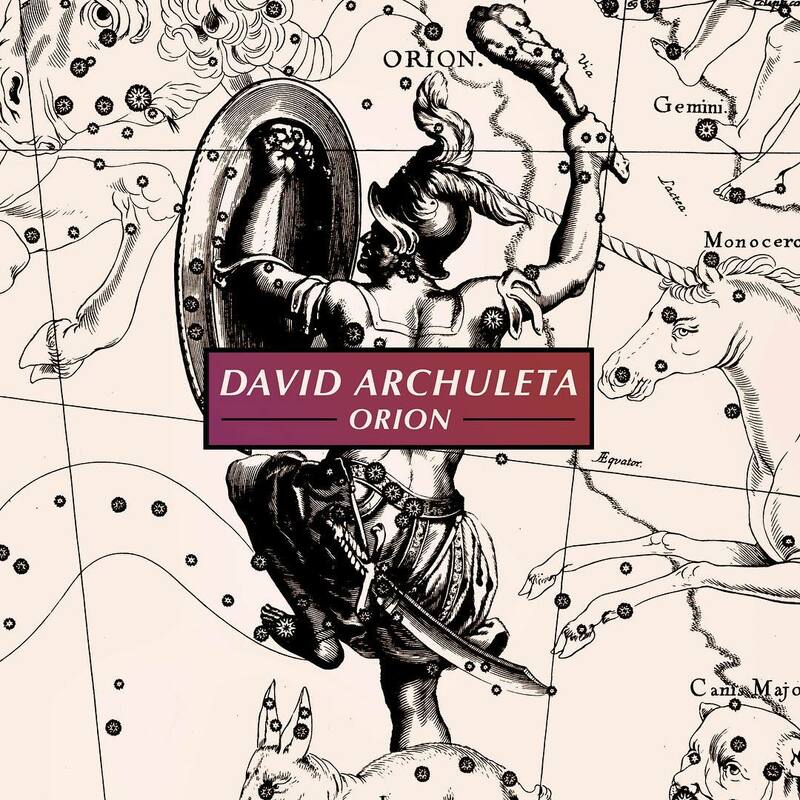 I was dealing your story and example pretty well until Angelica posted the story again of “David’s Graduation” The tears started flowing again as I remembered that story. I am forever grateful to have been there myself and grateful to those that helped make it happen. I will treasure it for life and have worn out one GCT video reliving those memories. 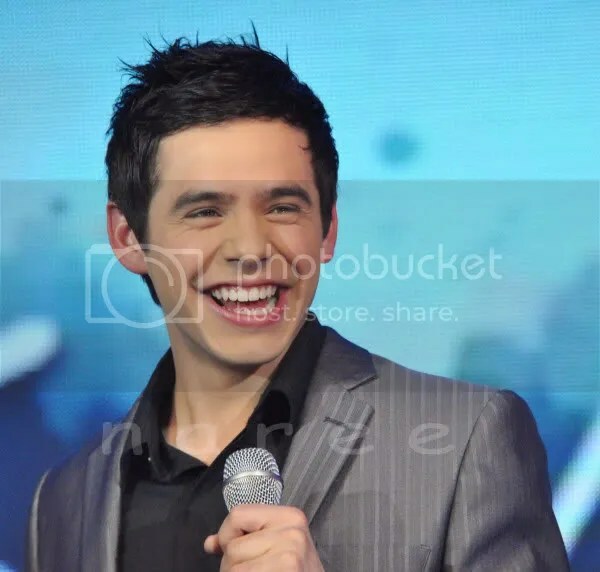 I’m quite proud of David for following his heart and am tickled pink that the Fan Sites remain active and we have each other’s support while we too make our lives more meaningful. Thanks for being so candid in sharing your story with us. I’m sure you helped many people today who were lucky enough to read about your journey when they clicked the link to this site. So happy your son is doing well now, thanks to your unfailing support and the resources you found for him. I have a friend who has two sons, one born autistic. He’s also in middle school now and doing extremely well. It was a long haul though until he uttered a word. How did he begin to speak? He started singing the lyrics to songs his Mom played every day on their stereo. And it all went uphill from there. Music can be so therapeudic! I see the parallel of the love we have for our children to our love for David. 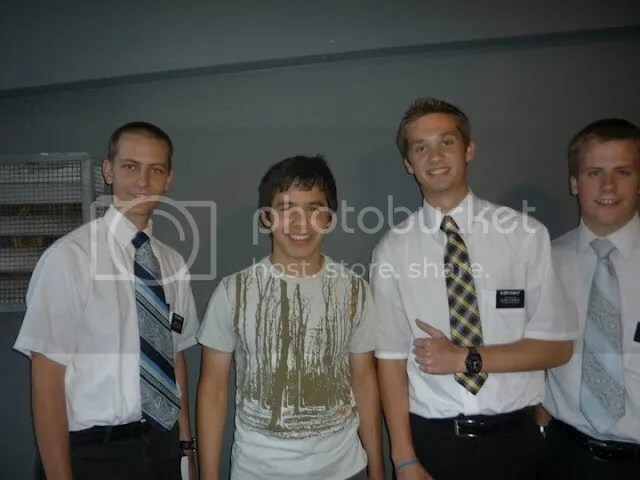 When he announced his mission I felt the hurt on a personal level as if he was a member of my family or a dear friend. 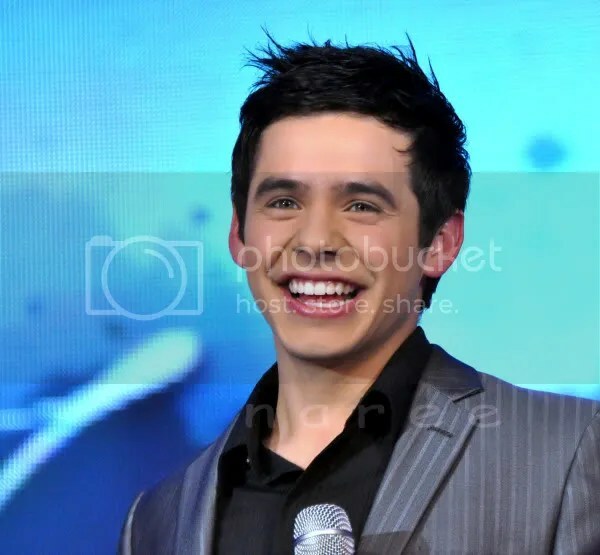 One thing I do know is that David is a blessing my life. Funnygirl, thanks for sharing your son’s story.I too have a grandson that still can not talk. He is almost 7 years old now. You have mentioned about a doctor that has helped so much with restoring his health back. I wonder if you can share with me his name. I would love to take my son to him.. I live here in San Gabriel, California. If you don’t want to post it here for some reason, please email me at -ambber888@yahoo.com. 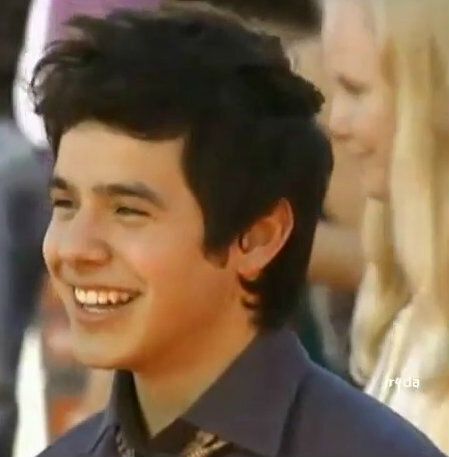 I have been a fan of David since day1 of his AI audition and I too believe that God has given David to us for a reason. Come join us for Week 3 of Nandito Ako! Funny girl…….thank you for sharing your difficult, but wonderful story. “one by one we were chosen to be on this journey”……….those words struck me because I have felt like that……as a new fan……that I was somehow blessed to be able to love and support David…….and have sometimes wondered how is it that I got lucky enough to be “chosen” (if you will) to feel what I felt and knew I wanted to know this young man and his music. I’m not expressing this well…….just known that your words ring so true to me. Thank you. Just came from Tuesday night at the movies. Nandito Ako was playing (cause that’s his only movie). Not his last though, I predict. Just watching his range of expressions: hurt, surprise, love, anger, rage, joy, comic mimicry all play across his features is something to behold. 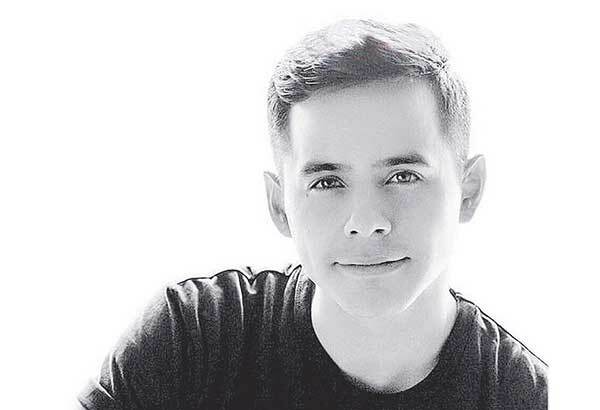 With a few more lessons, the right roles and great direction, he could be one of the finest actors ever to grace the stage or big screen. The kind of actor that, if he wants you to cry, you WILL cry; if he wants you to laugh, you WILL laugh. The genius kind. 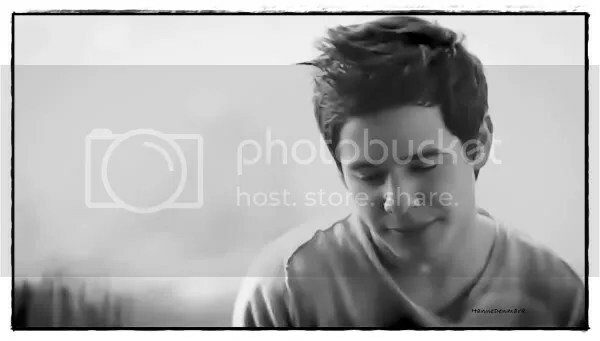 That was such a sweet video. I thought today while driving, what will it feel like to click on that first vlog he makes after he comes home? Can you even imagine what a sight for sore eyes and ears that will be? Miss him so much but isn’t it wonderful in a way too? Can’t explain it except to say I’m thankful for the burden of carrying him in my heart. Thanks to those who attended the Nandito Ako chat tonight, posters and viewers-alike! Two more weeks left and we’ll be done. Great variety of videos posted here tonight! Thanks for the one you posted – it’s a real tear-jerker! Note the footage at 26-30. Bebereader, the buzz is 26 to 30 footage must be the ones used for the next “Rainbow” music video. I hope so……getting excited! :26-:30 If he’s looking THAT good … and DANCING!?! … I’m not even going to hear the song for the first three times I watch. haha Oh, yeah! Bring it on! “One by one we were chosen to be on this journey, for reasons we may never know. 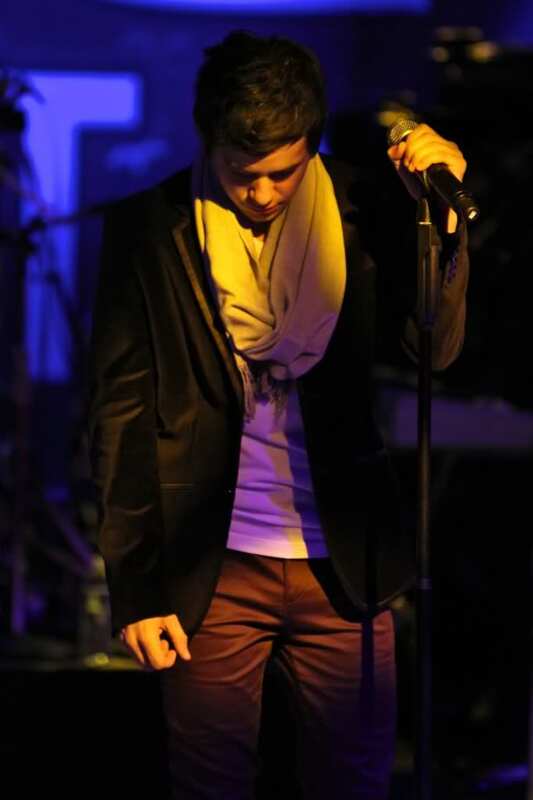 His voice took root in our hearts. His spirit made our own start to blossom. Now we must tend to the garden while he is away. MT…”If he’s looking THAT good … and DANCING!?! 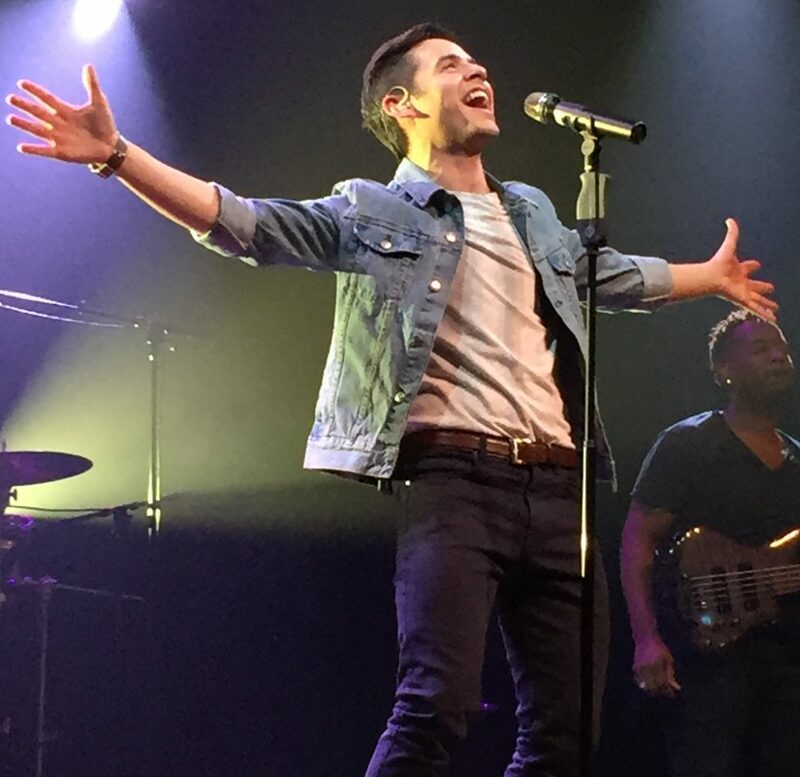 … I’m not even going to hear the song for the first three times I watch.” So true!! Ignorant question…could someone explain to me the opening words to ING. I could never quite understand what the lyrics of the first verse mean. I have to confess, up until the music video came out, that was the track I listened to the least. It just seemed so sad, and I’ve needed all the positive, uplifting music I could get this past year. However, after the music video came out, I saw the song in a much different light and I’m really touched by it now. I also want to welcome the new posters to The Voice!!! Gladys, Thank you for sharing. Thank you for sharing such a heartfelt story, FG. I’m so glad you found the help your son needed–you’re an amazing mom! I noticed that BEGIN. is available as a pre-order at walmart.com. Good news I think. FG, this is so beautiful. Thanks for sharing with everyone. I don’t think I told you this, but my nephew is autistic and is now in college, year 2. Just opened his own computer repair business as well. All due to parents who wouldn’t ever take no for an answer. 🙂 You are doing that same thing. Remember we chatted a bit right after “the announcement”? You asked me how I was doing, I said I was perfectly fine. That I had been through worse when my son was in Iraq twice and I could never talk to him even once, even when he was hurt? Confession. That was my guilt talking and I wasn’t fine. I couldn’t admit to it. The reasons are too complex and long to get into, so I’ll leave it there. But I’ve felt bad about it ever since. Virtual hugs to everyone . P.S. SB , I got my bracelet . Maraming maraming salamat po !!! Betsy, that must have been awful to not be able to talk to your son even when he was hurt in Iraq. (((hugs))) You don’t have to get into it here at all, but I am not OK with your feeling bad. So don’t, K? MT#26, pursuant to Bebe#24, I hate to admit how many times I’ve replayed seconds .26 – .30. I just really don’t think I’ll survive all the pure preciousness of the Rainbow MV. In lieu of flowers, please make a donation to a David charity of your choice. And asking me what it means to me. Like throwing back to someone their words and asking them to explain themselves again and again. In poetry, and song writing is poetry, the sentence structure is sometimes changed up, not to confuse, but to inform and enlighten. You are made to take a second look or think about the meaning from another angle. So for me it seems to be a lament from someone who has to constantly deal with a loved one who analyzes and twists the meaning of what is said because they have trust issues. No matter how many times they are told they are loved, they find reasons to doubt and want more proof. This is not a song written by David, not his words, but I think it relates to the way some fans react to things he says too. He said/tweeted this, so that means he loves others more than us, or that means he’s not going to do music anymore, etc, etc…Yet how many times he’s told us he loves us, that he will always do music, for this is all he knows. Angelica, so easily distracted haha Also thank you for posting the link to FG’s GCT article. Brought back so many wonderful memories. I sometimes can’t believe that I was actually there. I agree with this 1000%. 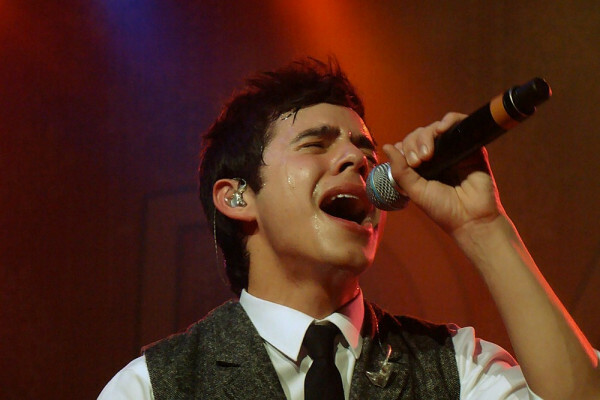 what WAS that, David bopping and singing…something! haha thanks for posting those. Whatever he was doing, he looked good doing it. :)) Have to rewatch that again. Estrella,Bee L., and Bychance, good to see new faces! Welcome! 29 Xaris, that is good news, if Walmart is carrying it, it’ll be available everywhere. If David’s ever on the big screen, you’re going to have to learn to spazz quietly so you don’t get tossed out. LOL You wouldn’t want to miss the ending. There might be a romantic scene. David, 30 ft. tall, giving “that look” and you’d miss it! Can you even imagine a close up of those eyes on the big screen? #32…Vee, que son muy bienvenidos! Thank you so much for sharing your story. Our love for our children is so deep. I understood more about how God loves us as His children after the birth of my daughter. There is no way to describe it. I am so glad that your son is doing better and thriving!!! I, too, mourned when I heard David was leaving for 2 years. But, I do believe, that he, too, will thrive as your son did. This mission will be good for him. I’m happy to tend the garden in the meantime. Hugs to you…thank you for opening your heart to us. Thank you for the welcome! I am happy to tend the garden till David returns. Bee, are you the same Bee (maybe it was Bea) who delurked the same week as me on Snarkys in 09/08? #33 Angelica —That is my take on the words to the song also—cept you said it better. I thought the guy, who must have to travel a lot, always has to tell his lady that he loves her—every day–because she is insecure about it–always questioning his love—as you say a trust issue.— Good way to chase someone away!! New pic found on Twitter! #42 Bebe that picture is all kinds of wonderful. Paolo is handsome. FG, thank you for sharing your story about your son. I’m so glad things worked out for both of you and your family. There’s a lot to say about being persistent in finding answers to problems that arise in our lives. That’s one thing I love about David. He is persistent in following his heart, and the direction that he feels is right for him. 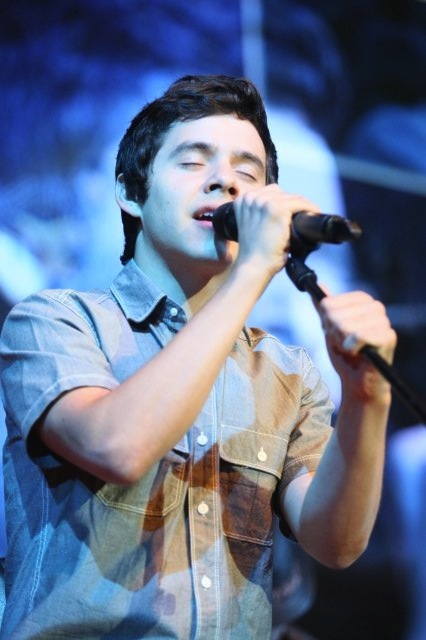 #4 – Abrra, I just love how serene he looks in that pose. That’s my new desktop pic. He’s just…gaaahhhhh! #42 – Bebe, I’d love the know what Paolo is saying or coaching David on in that picture. I love the ING video, but I sure would love to see more of what may await us in Rainbow!!! Love the little clips of him dancing. He just makes my days so much more enjoyable. I’ve added BEGIN. with a link to Walmart on the left sidebar!!! The purchases there get reported to mediabase for sales numbers! The rule is not to buy more than 5 at a time so they can count as separate units not as a 1 bulk unit. 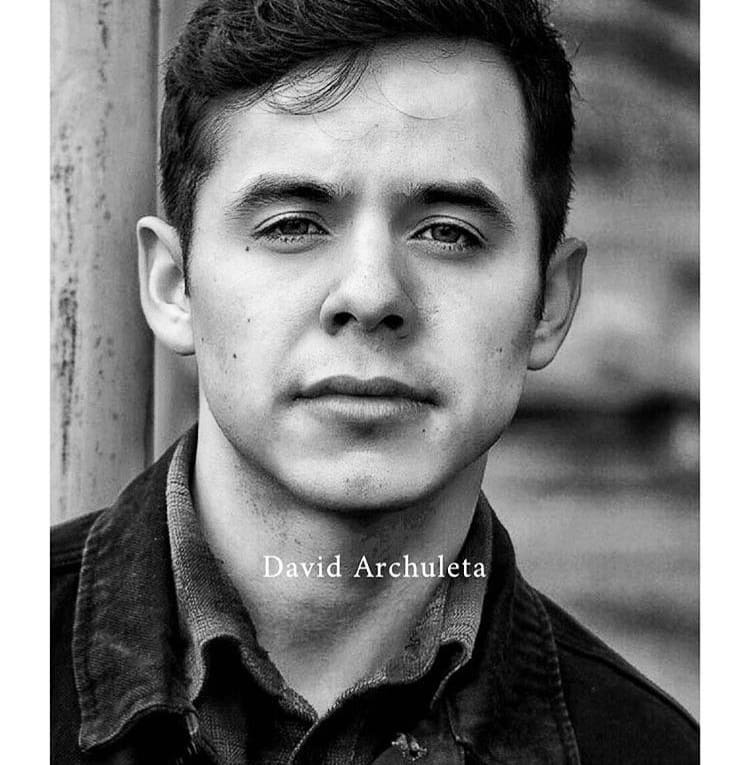 Please vote for David here! 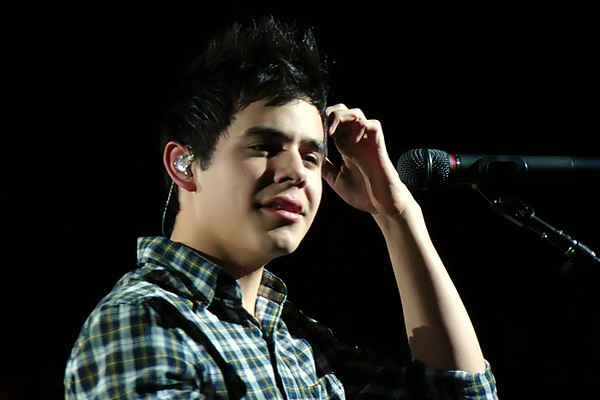 Just when you think @nareejo can’t have any more great pics of David, she surprises us! I just added more pics to #47. Thanks abs–more fuel for my fire!!! Thank you so much to all of you who supported The Singer and the Song Project! In total, Camp ASCCA received $1,820.00 from the amazing Archie family! 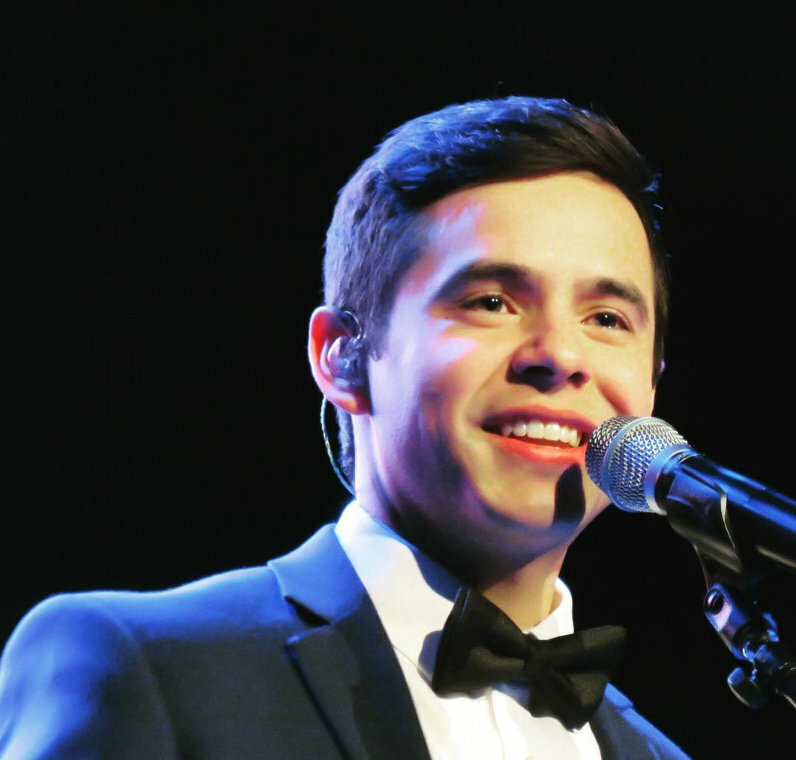 Congratulations to Gwen Porea (@GwenPo) who won the portrait of David! The winner of Jennifer Barry’s calendar was Cheryl Nelson, and the winner of the picture that inspired the painting was Scott Talmadge (@Scott_NJ). Donors who contributed $50 or more will receive an 8×10 print of the painting. Everyone who supported the project, whether financially or in spirit,is a winner in the eyes of the campers! 8×10 prints of the painting are also available for $8.00 (includes shipping in the US). A mailing address can be provided for payment or payment may be made through PayPal. All net proceeds go to Camp ASCCA! Please contact me at thesingerandthesong@gmail.com if you would like a print. Again, thank you! You have made some very special people very happy campers! 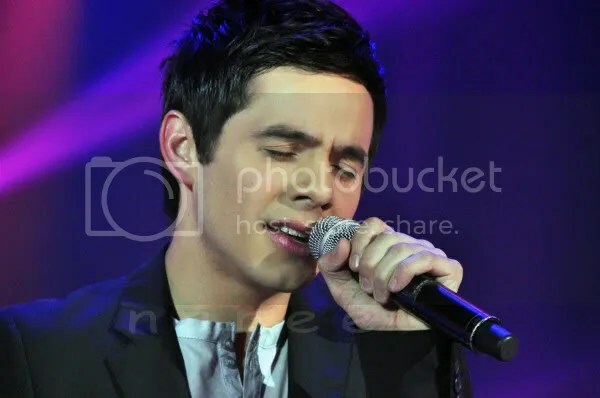 Admin edit: See full post including photo of 8 X 10 prints at http://fansofdavid.com/ Scroll down to The Singer and the Song Project. Congrats to all the winners, especially the campers! Thank you Paula, for using your talent to bring to pass something…Beautiful. Oh my Funnygirl! I am very happy for you, your son and your family! Your determination is a beautiful tribute of love to your son. I was brought to tears of sadness and then tears of joy as I read your story. Thank you for sharing your heart with us! I too was shocked and couldn’t pick my jaw up of the floor for hours when David announced he was leaving for 2 years! I have since recovered and have so much to be thankful for. David was one multi-tasking guy before he left! He knew we would need all these goodies to ease the pain. God Bless him! Time to get up! Just kidding, you can see the time I had to get up! But, I found a few treasures! Angelica – when I saw that motab rehearsal pic I was blown away! That was so sweet of you and the feelings came rushing back! Thanks so much to everyone for the heartfelt comments! You are all amazing! A few asked about the doctor we go to. There is a list of docs that use the protocol we followed: http://www.autismtoday.com/clinician-list.html Another option is to visit Chicago or one of the travelling clinics of this amazing treatment center: http://www.hriptc.org/index.php Any questions just ask me! Angelica! That picture of the Motab rehearsal! Still gets me to this day!! How sweet you are! Sooo the first week of the new transfer is over! It was a blast! Our new companion is SWEET! He looks and acts JUST like Brandon Crow. Like its kinda scary how they are the same. So his name is Elder Alex Thompson. He is from Eagle, Idaho (just outside Bosie). It is just like talking with bcrow when I talk to him, and he loves “The Goofy Movie”… just like bcrow. haha. Look him up on facebook, its awesome. The Sounds game (minor league baseball) was awesome!! There were around 60 missionaries singing the national anthem and the owner (or whatever of the team/field – idk, some high up dude) told President Hutchings that the way we sang the anthem is how it should be sung every time. NEAT! Go Mormons! 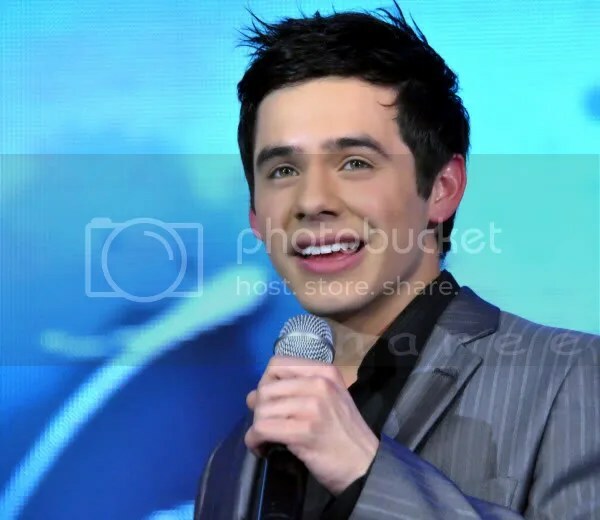 While there I met David Archuleta. 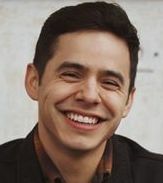 I went to go buy a Sounds baseball hat (which totally rocks btw) and I was like “wow that guys short… WOW thats David Archuleta! !” So I walked right up to him and was like “hey, can I get a pic with you?” He said sure, so we started talking and I got him laughing and we had a jolly good ol time of about 45 seconds. I have the video in #46 imported to my Movie Maker and have set the effects to slow motion. I need help thinking of a song or music that would be a good match. I plan to extend the video to about a minute and a half. To learn…to teach…to nurture…to love. the pictures on SD. Yes out of respect for David it is good to keep to the archives. Lots of ads for Stadium of Fire here. Scotty McCreery will be there. Sigh. But I must admit i cannot be depressed. Remembering the excitement and good times from last year gives me a great biiiiig smile. Remember Tawna? Ah, yes! The “parting is such sweet sorrow”! We yearn for what we might have had, but had we received it, would we be wise enough to yearn for those “even greater” blessings in our lives? You capture the point beautifully! We only dream of what might have been or what our limited vision may paint as possibilities. But God knows no such boundaries and He paints with a canvass that stretches our hearts, spreads the colors of our souls and absorbs our efforts/fears/passions until the finished work amazes, its scope clearing the horizon of our minds with one blinding sweep of realization: We are not alone. Your vision is something to behold! Thank you for making me think, always. I know it’s not Christmas but when has that ever stopped us? LOL I found this on YouTube and had to share. 33 Angelica, thank you for your very insightful answer to my question. I really liked your interpretation and particularly found the comparisons you made to some things in David’s life very interesting. Kaycee, great to “see” you! Hope your summer is super! Abrra, thanks for bringing the poem over for us. It’s beautiful. 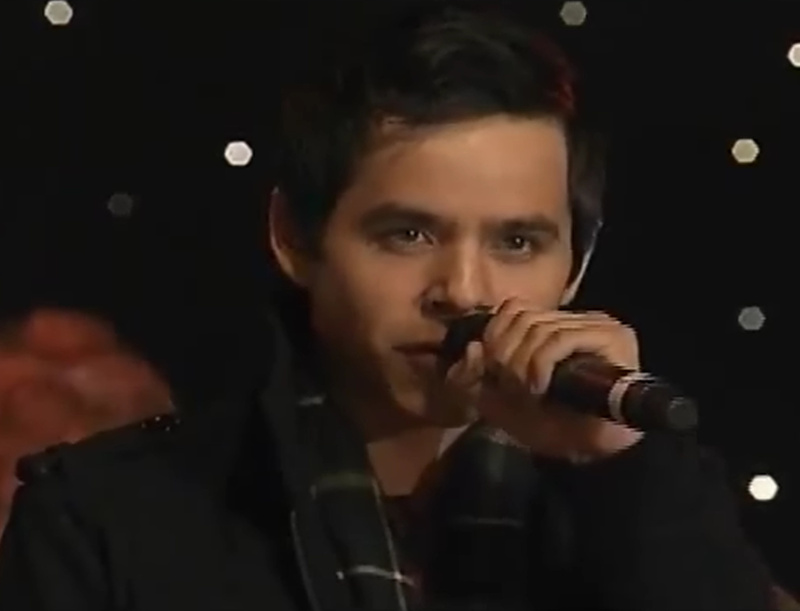 Love the Christmas video/promo vid! (Movie trailer? haha) That was great. Very well done. 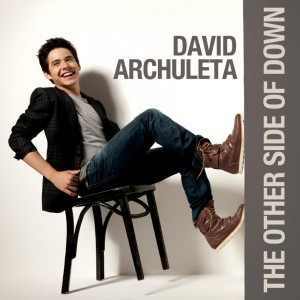 PS Got caught today with my earbuds in … singing with David (really loud) in the kitchen while cooking. LOL Hubby had a good chuckle, but was sweet and said he thought it was really cute. hahaha Sweet guy cuz I sing awful! BEGIN. at #33 at Walmart! Get your preorder in!!! 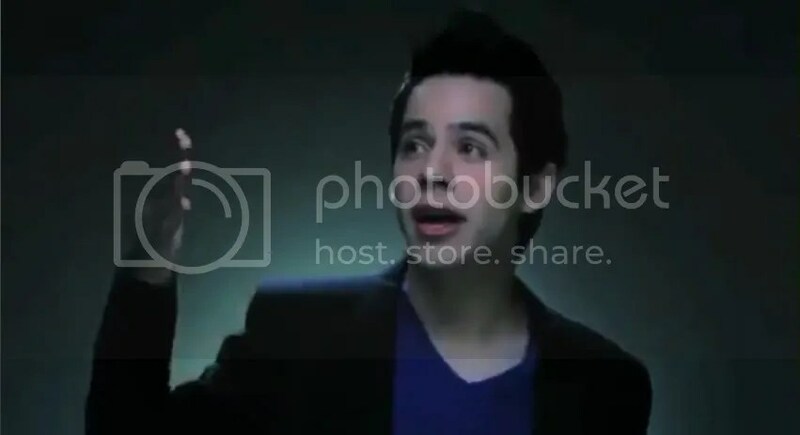 When I watch the I’ll Never Go video I love that short scene at around 2:54 where David juts out his chin and looks like he could conquer the world. Kind of like a man on a mission. hey all! Is everyone as sweaty as I am ? haha The whole dang country is hot! speaking of HOT those pics at 47. Abrra ,are not helping… nevermind, yes they are. Do not remove them under any circumstance. :)) They are gorgeous! le sigh is right. 60. Bluesky…when you write on this comment page, its as if you have a palette of beautiful colors in one hand and your pen in the other.You create colorful, wonderful images with the stroke of your pen as you write your comments, I love what you wrote. I love the thoughts you share. Bebe, that video is a great find. I love it. Dayzee. He does indeed – conquer that is. ‘Stadium’ should be good, though. I am glad for McCreery. He will do a good job. I never thought about the hair issue like that, but by golly I think you have something there!